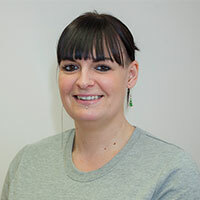 My name is Emma and I have been working here at Mulberry Court for 10 years. I first started in 2007 as a Kennel Assistant, then moved up to a VCA (Veterinary Care Assistant), after having my son I came back to work in 2012 and returned to work on reception. I have a lovely dog called Treacle, who is a big ginger greyhound cross, and at home 8 chickens. I enjoy my work very much and love how I have grown bonds with clients and their animals throughout the 10 years I have been here.